Export and import data for August is now available. There were many positive events in August. 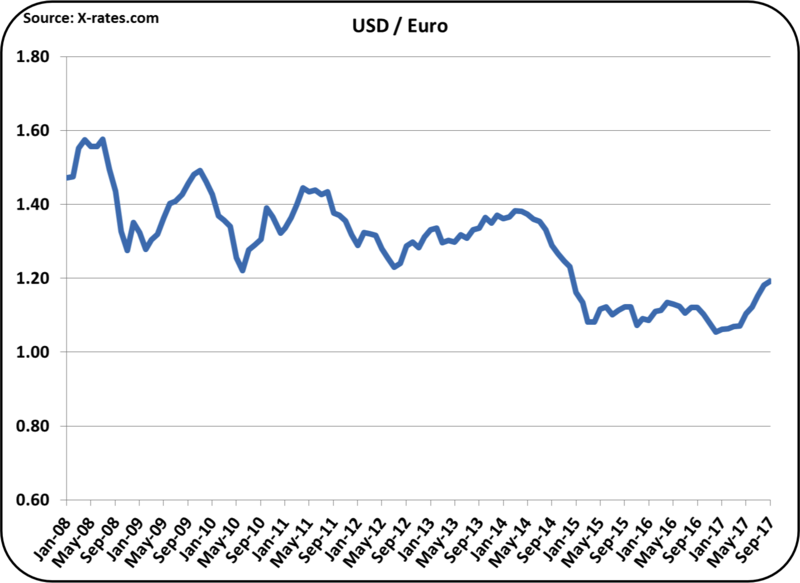 There were again improvements in exchange rates, which will aid in future exports, as a weaker USD makes U.S. exports more financially competitive. Cheese exports were up (Chart I), and nearly matched the record levels of 2014 for the month of August. Nonfat Dry Milk (NDM) exports (Chart II) were up compared to the prior month and imports were down. To meet and exceed the export positions of 2014, there is additional work needed, but August was certainly a positive move toward that goal. 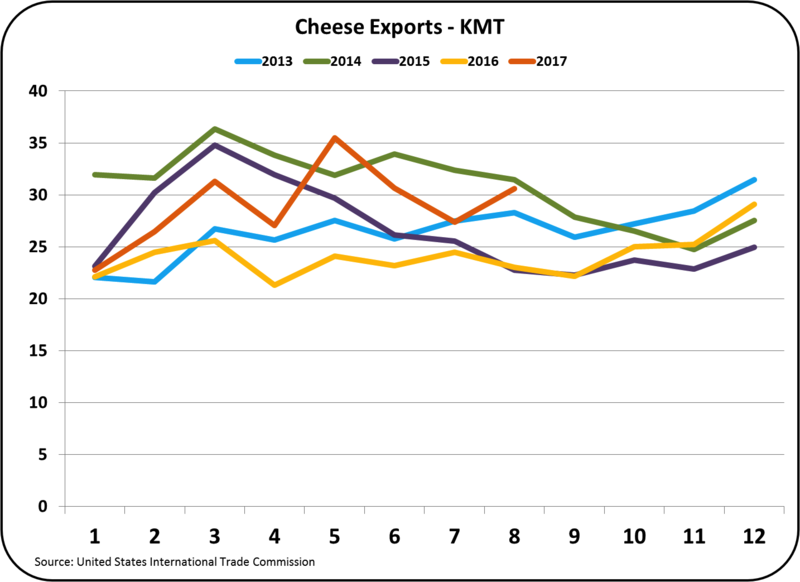 Mexico remains the strongest market for U.S. cheese, but exports to South Korea and Japan are also showing strength. Due to trade restraints, there are very small amounts of cheese exported across the border to Canada (see Chart III). 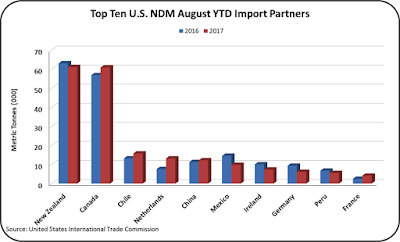 With NAFTA re-negotiations in process, there may be an opportunity for more dairy trade with Canada. 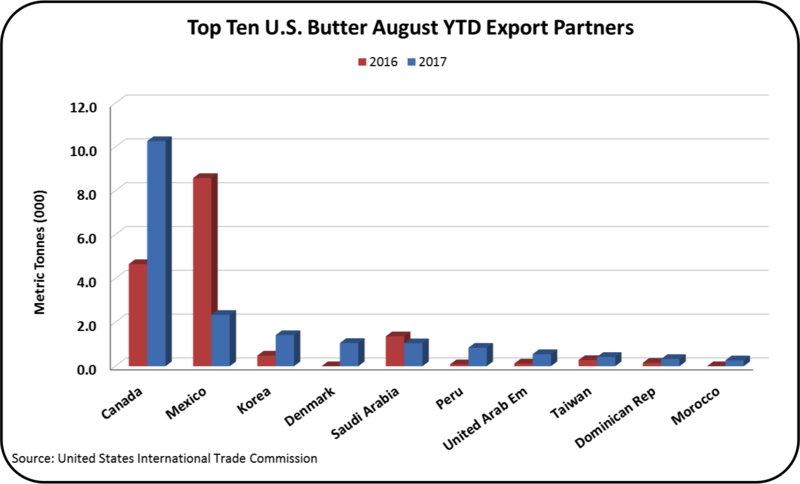 Dairy exports and imports between the U.S. and Canada are primarily between butter and NDM. 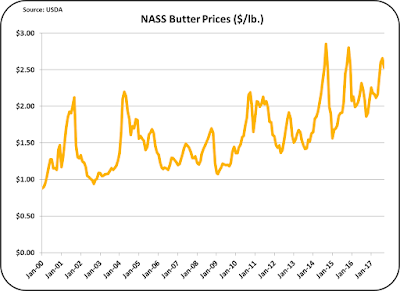 With the global consumer increase in butter consumption, a glut of NDM is developing. Canada is perhaps an example of where other countries may be going. For over a decade, Canada has struggled with an excess of milk protein in the form of NDM. When butterfat is used for churning butter, the remaining skimmed milk is typically dried. 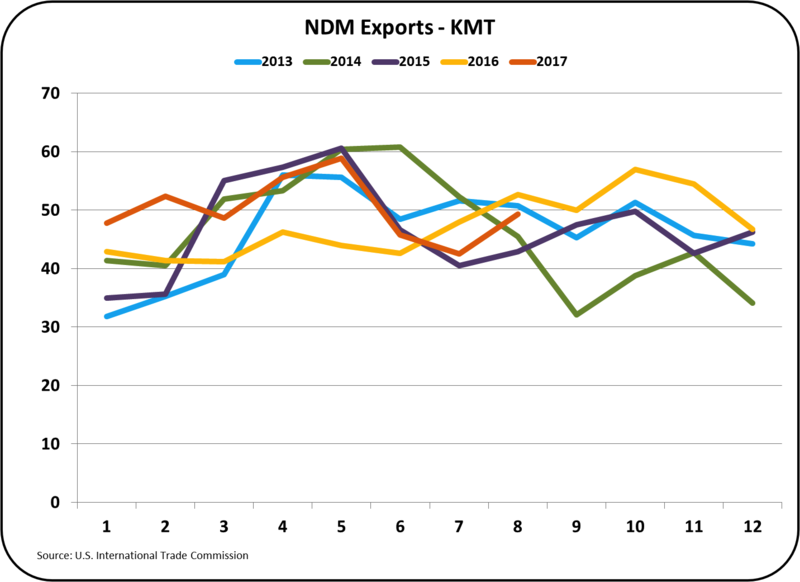 Because of the high cost structure of the Canadian dairy industry, it has been difficult to export the excess NDM profitably. The Canadian managed system has used various formula revisions to encourage butterfat production and minimize milk protein. Current technology has very limited tools to make this happen. 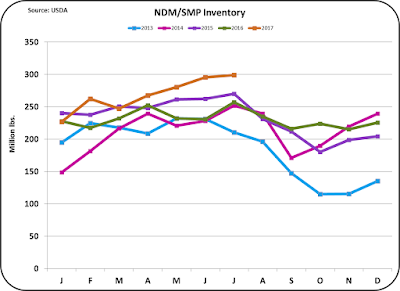 As a result they have typically struggled with high inventories of NDM. 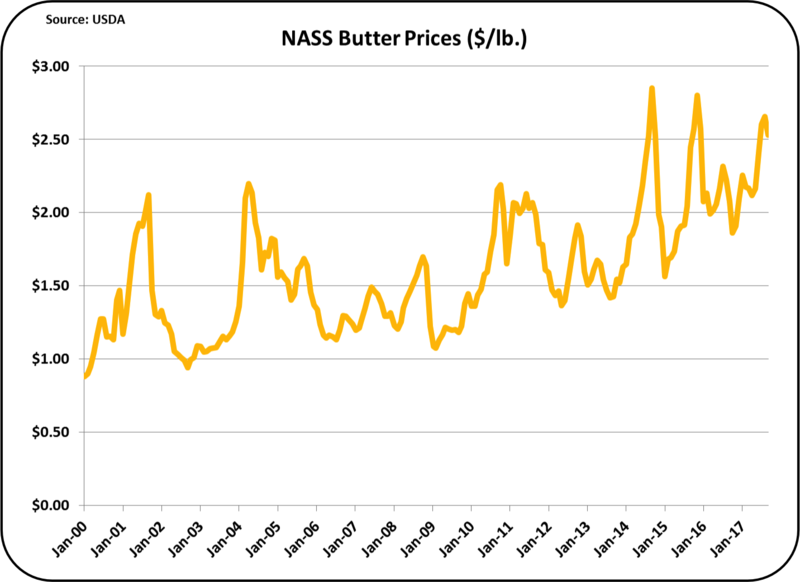 Charts IV and V below show the increased exports of butter to Canada from the U.S. and the increased imports of NDM from Canada to the U.S. that result. Although dairy trade with Canada is excluded from NAFTA, where there is a need, Canada has allowed imports of butter and exports of NDM. 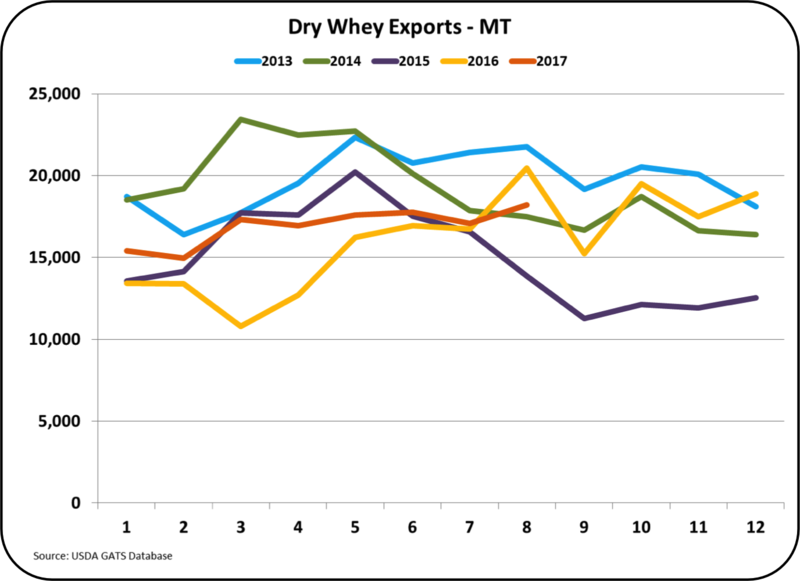 Dry whey exports (Chart VI) also showed improvement over the prior month and established a 2017 record month. 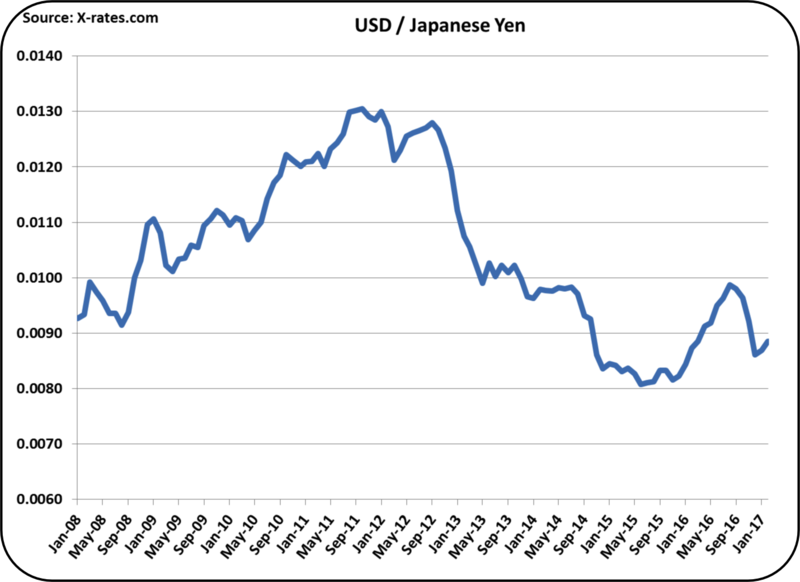 As mentioned above, exchange rates continue to move in a positive direction adding support to the competitiveness of U.S. Exports. 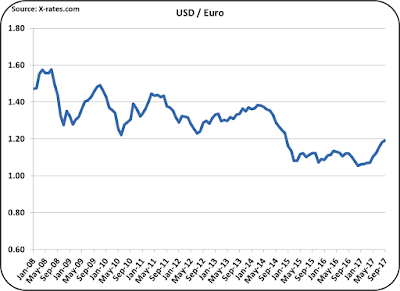 Europe is the biggest international competitor and the exchange rate has now changed from a low of $1.08 USD/Euro at the beginning of 2017 to nearly $1.20. Hopefully this trend will continue. Exports of cheese to Japan improved in August and certainly the exchange rate between the USD and the Japanese Yen helped that. The stronger Yen is still a short term event, but hopefully this will continue and support future exports to Japan. 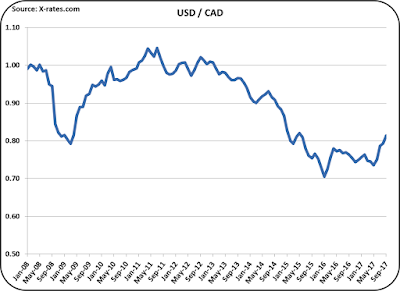 One of the important exchange rates is with the U.S. neighbor, Canada. 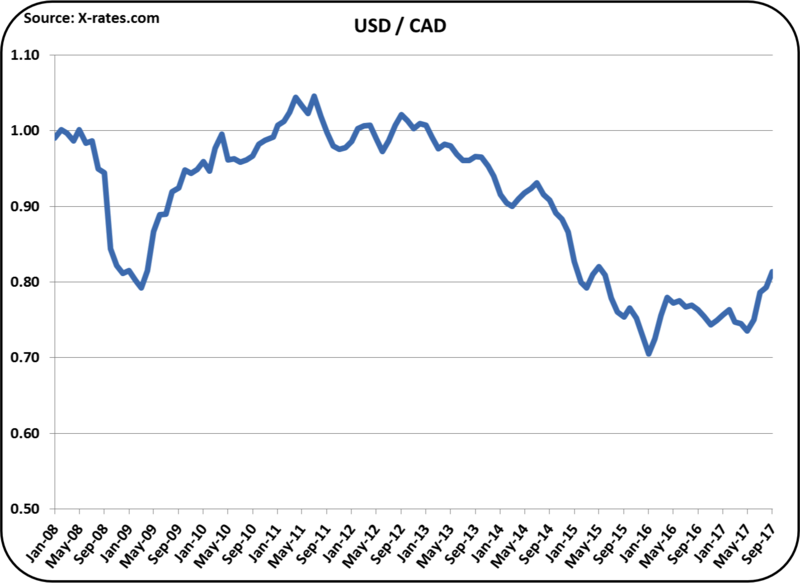 Again, the impact of this will probably be known only after further NAFTA negotiations as dairy exports to Canada are currently limited by exclusion from the current NAFTA agreement. While the Export/Import data was only mildly positive for August, it is good to see things moving in the right direction. There has been a lot of interest generated from the October 7 post to this blog concerning the proposed change to the Class I formula.. An addendum has been added to express comments from the Farm Bureau. They have not taken a position on this change, but are continuing to evaluate the impact. The Farm Bureau comment is appreciated as it clarifies their position. On October 4, 2017, September Class and Component prices were released. Chart I below shows a lot of red as prices fell from the prior month. 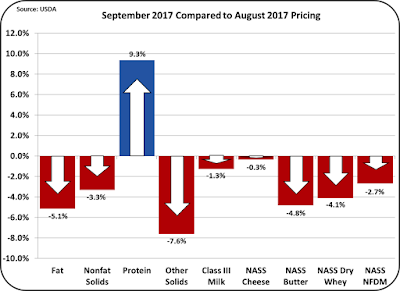 The only positive change was in the price of milk protein, and that increased only because butter prices fell (see why in this post). All of the commodity prices, which are used to calculate the component prices were down. This includes cheese, butter, dry whey, and nonfat dry milk (NDM). This changed the long-term trends only slightly. 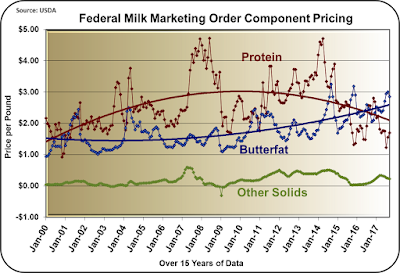 Note that the price of milk protein was higher than butterfat for the first 14 years of the Chart II. 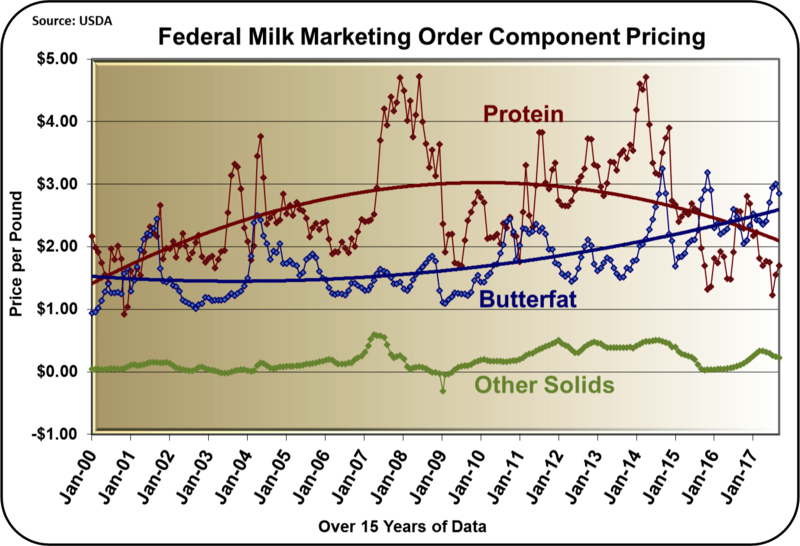 Only when consumption of butter began to increase globally did the value of butterfat exceed the value of milk protein. That change has remained in place since 2014 and there is no short-term change expected. 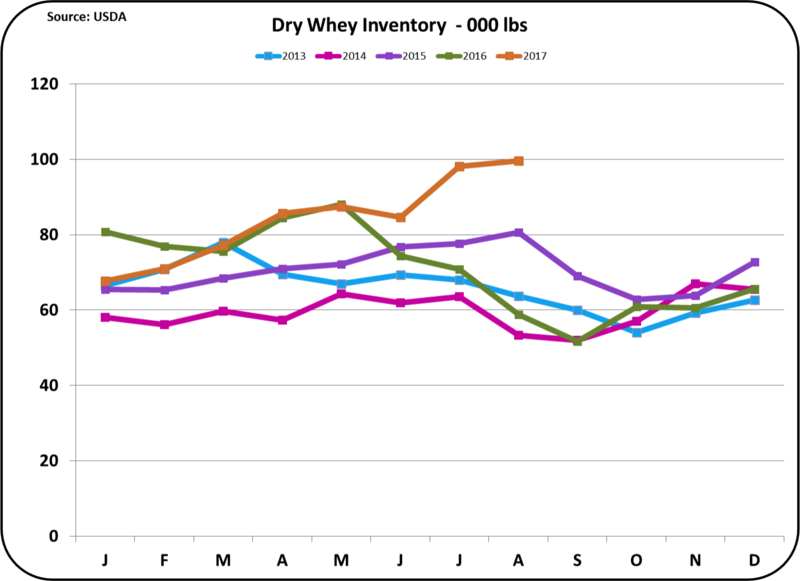 Inventories of three of the four commodities used to price milk are high, pushing prices low at least for the near term. 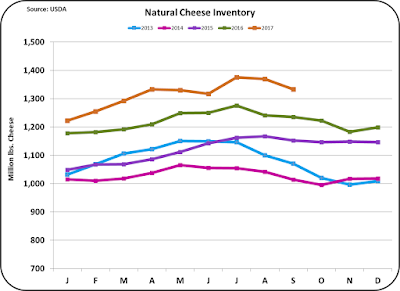 The inventory of cheese, shown in Chart III below, continues to be significantly high. 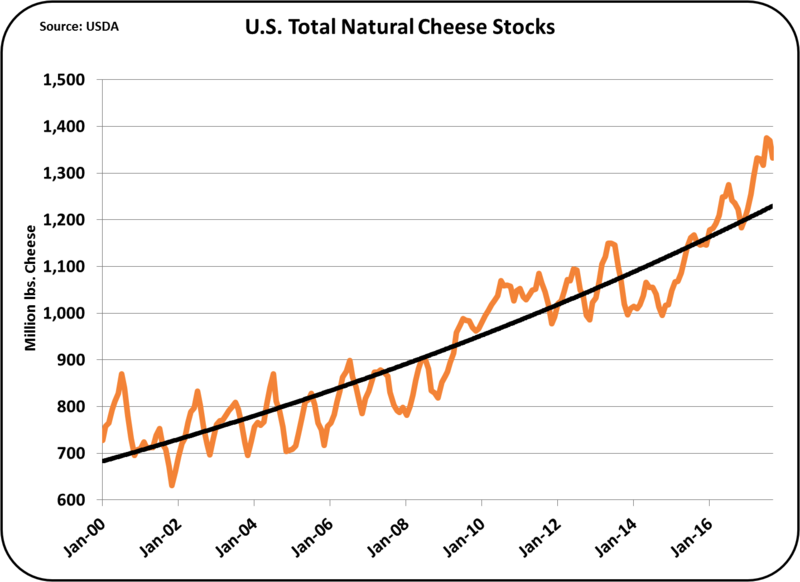 The growth of cheese inventory since 2013 is three times higher than the growth of consumption. 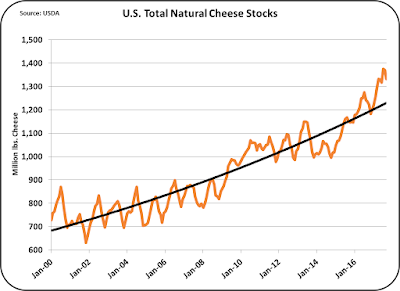 Compared to 2013, current cheese inventories are 30% plus above the levels of just four years ago. Chart VI shows the inventories levels over the last 17 years. 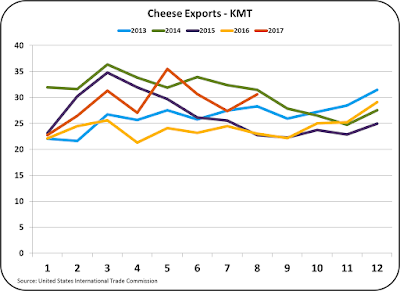 There is a trend line that shows the normal grow consistent with cheese consumption and exports. 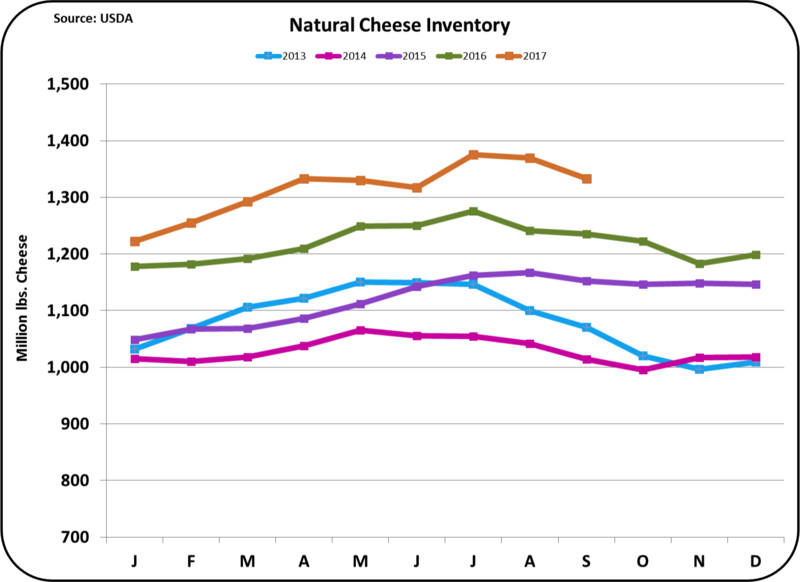 The recent month's cheese inventory is well above the growth trend line and is near all time highs as compared to the trend line. 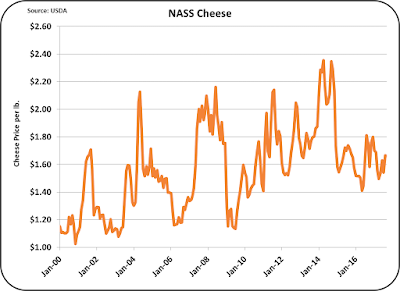 These high cheese inventory levels are a place to park excess milk production, but they also impact pricing as there is more cheese for sale than there are buyers for cheese. 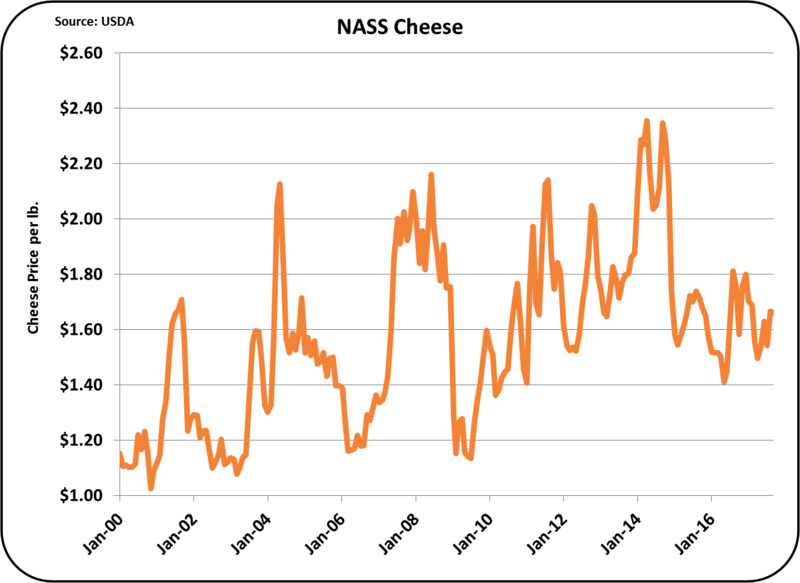 The high level of domestic cheese inventories will continue to keep cheese prices low. The extreme size of the inventory cannot be corrected through consumption. It can only be corrected, through reduced production and/or increased exports. 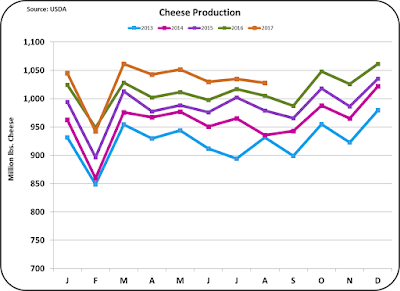 Chart V below shows cheese production for the last five years. As long as there is excess milk, cheese production will probably remain high. 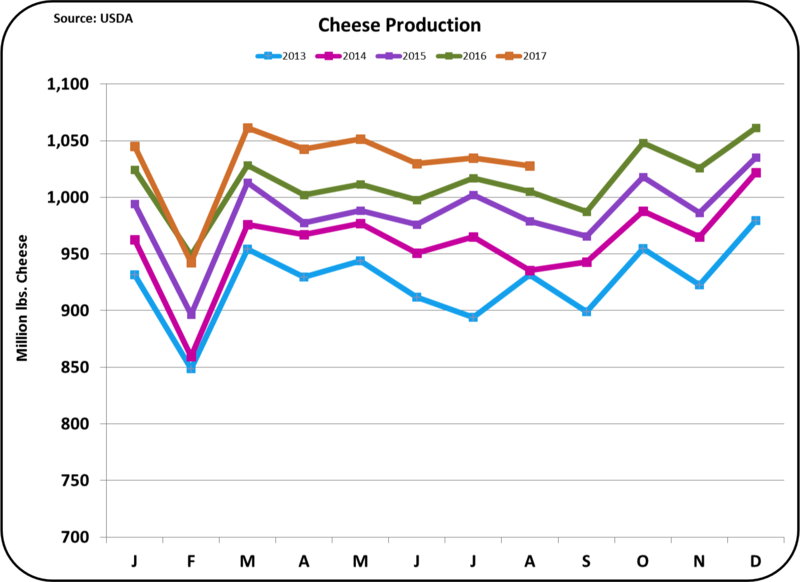 In the last three months, there has been a reduction in cheese production, but it is not enough to bring inventories in line. 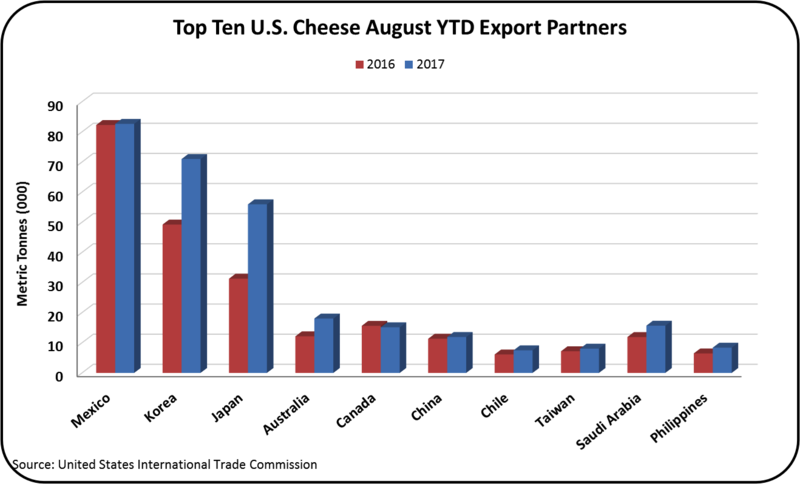 Cheese exports did increase in August. More detail on exports and imports will discussed in the next post to this blog. However, it will take time to reduce the cheese inventories, which in turn will bring higher cheese prices and higher Class III milk prices. Nonfat Dry Milk/Skimmed Milk Powder (NDM/SMP) is the largest dairy export product. 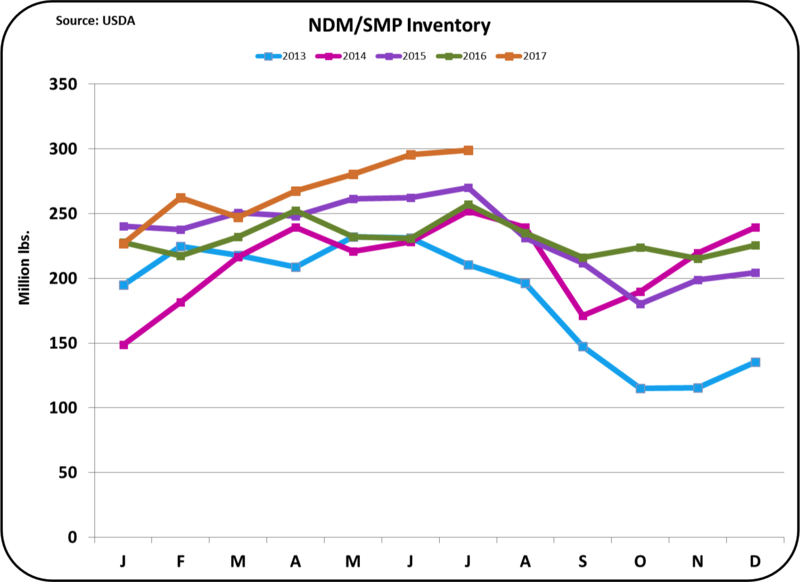 Recently exports of NDM/SMP have lagged prior months, and inventories are starting to build. NDM and especially SMP are primarily export products whose price is determined on the global market. The high inventories shown in Chart VI mean that international traders must compete hard to move these inventories. That means, lower prices. The same can be said about dry whey inventories. Higher inventories mean lower prices. 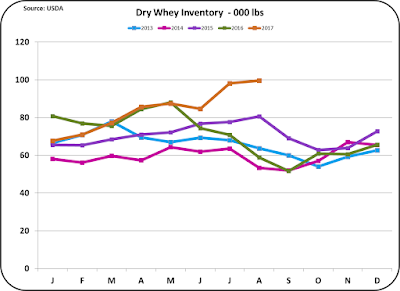 Nearly half of dry whey is exported so prices are very dependent on the international markets. All of the current low prices result from over production compared to domestic consumption and exports. 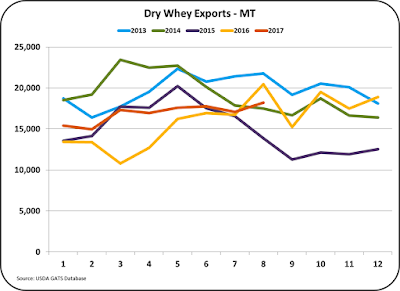 When exports began to fall, milk production did not decrease, and that has created excesses that are keeping prices low. In a future post milk production will be compared to demand. There is currently a proposal to change the method of calculation for Class I milk. 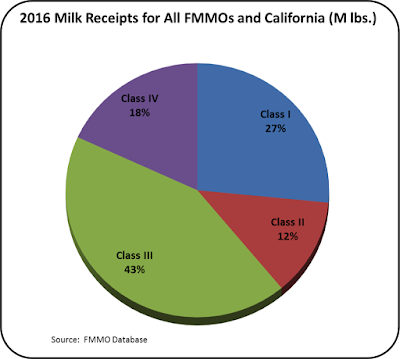 Class I milk is the second largest milk category with Class III being the largest. 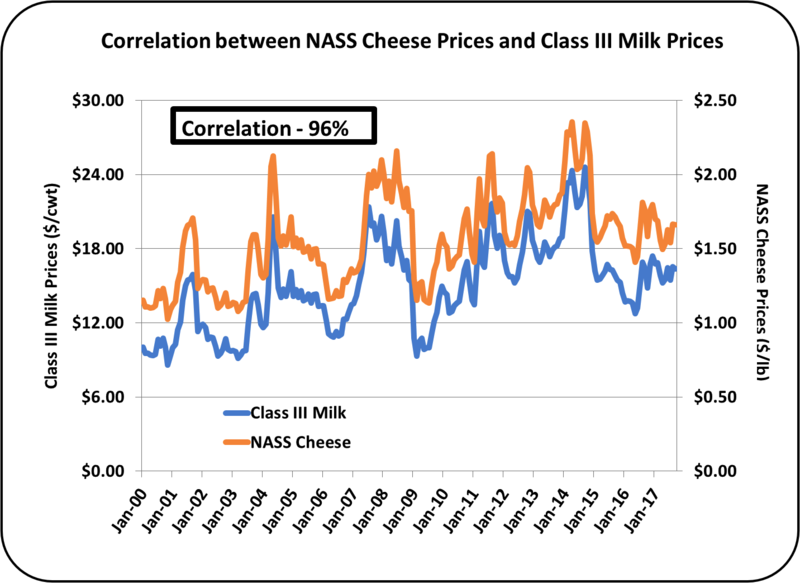 Therefore any change in the method of calculating the Class I price will have a significant impact on producer milk prices. Chart II below shows 17 years of of Class III and Class IV prices. Obviously, the Class III and Class IV price move in a similar pattern. 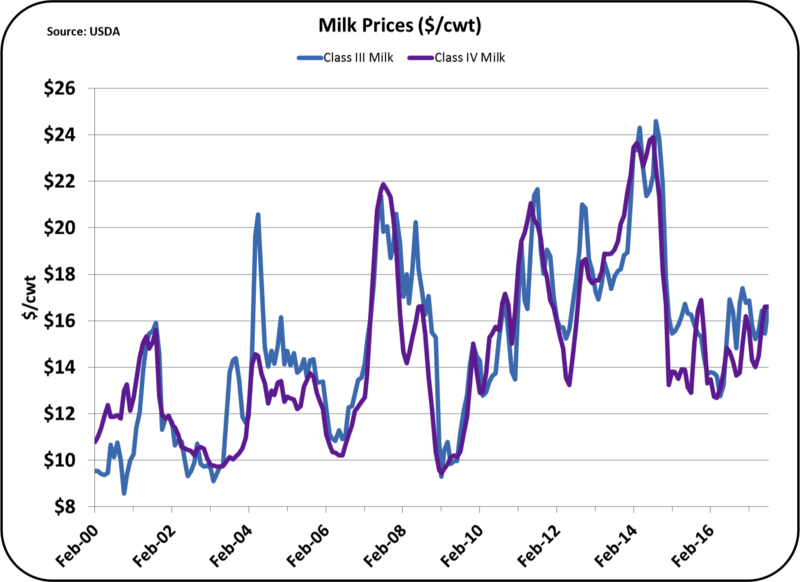 In the first half of 2017, the Class III price was not high, but the global glut of nonfat dry milk has kept the Class IV price lower than the Class III price. The rationale for this is that it would allow processors to more precisely hedge the price paid for Class I milk because the current hedging tools require processors to choose between hedging with Class III or Class IV prices. If they choose the wrong one, the hedge may not precisely fit the final price. 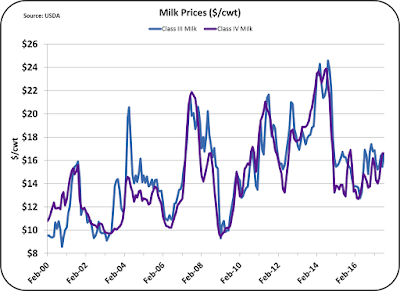 If the processor choses to hedge using the Class III price, and international events drove up the price of nonfat dry milk which would increase the Class IV price, their hedge would be lower than the actual price. For producers, the same can be said, but there are very few producers who use hedging tools. Most all processors do use hedging to minimize fluctuations in cash flow and profits. Those that use hedging (primarily processors) would benefit from a simplified method of hedging. 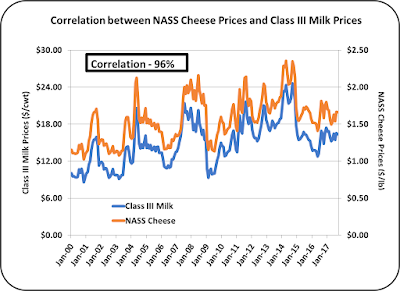 The rationale is that more processors would be willing to produce fluid milk products if they could accurately hedge the price of milk and minimize they risk of inaccurate hedging. In that way, more Class I milk would be produced and producers would gain by having a greater market for Class I milk. It's not hard to see the folly in the logic of the above paragraph. Milk consumption is not constrained by processing capacity. The decrease in per capita consumption of fluid milk has been going on for nearly a century. It is influenced primarily by competition from the many other choices in available drinks. Because consumption decreases every year, processing capacity is more an issue of which processing plants should be closed, than what new ones should be built. There are no grocery stores in the U.S. that do not carry milk because of a lack of processing capacity. See a recent post to this blog covering U.S. consumption of dairy products. How would this change impact producer prices? The most impacted Federal Order would be Florida. Their milk is primarily Class I fluid milk. A formula change that would change the price of Class I milk would simply change the producer income. This would be true of the other three orders paid on the "Advanced" pricing system, although the impact would be less. For the six Federal Orders paid on the component system, the proposal would be seen in a changed producer price differentials. The impact will be minimal for Orders like the Upper Midwest, where fluid milk makes up a very small part of milk usage. 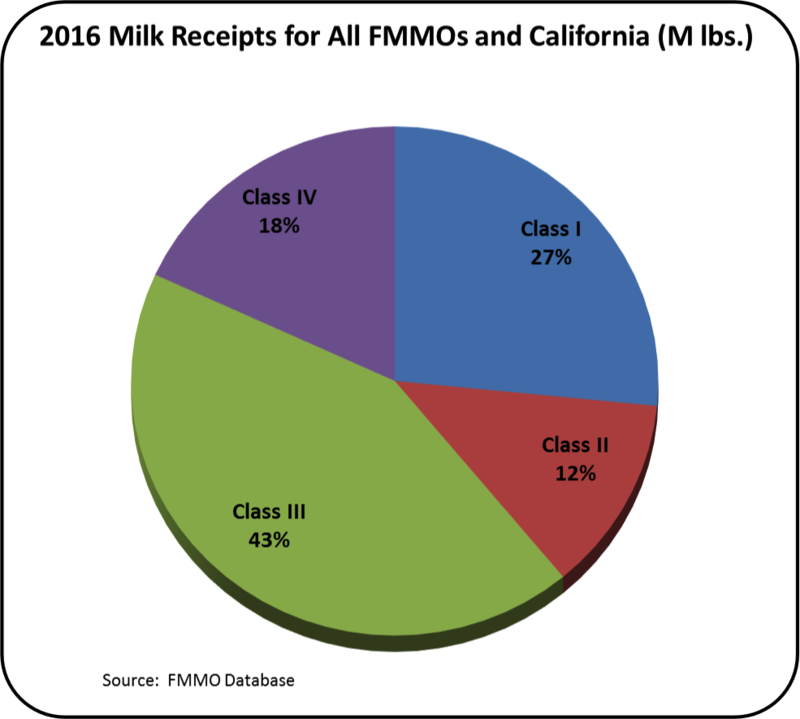 It would be greater in areas like the Northeast Federal Order, where a significant part of overall milk usage is Class I. In 2018, California will likely become a Federal Order paid on components. If the new Class I pricing formula is approved, the proposed formula change could influence the upcoming vote of California producers and their cooperatives. On October 12, Dr. John Newton, Director, Market Intelligence for the American Farm Bureau Federation asked that an addendum by added to this blog. He stated that "The Farm Bureau has not taken a position on the proposal to change the FMMO Class I formula." He also stated that "The proposal is currently under evaluation by the Farm Bureau."